This is my first time roasting a whole a bird. The recipe was choosen as November pick for the online cooking group French Fridays with Dorie. This recipe is roast chicken for the lazy (or les paresseux). Seemed like a good way to roast my first chicken. I have mixed feelings about the process. It took forever...90 minutes. It made the bottom of my pan black and splattered all over my oven. And I'm pretty sure the high heat was the cause of my pan cracking the next day when I took it out of the water where it was soaking. I used a pampered chef stoneware 9x13 casserole dish which is now destined for the trash can...I'm a little sad about that. The flavor of the chicken was not anything to write home about. It's not all bad though. It was easy. The skin was brown and crispy. And the infamous piece of bread that cooked under the chicken was pretty tasty. But I could only eat a few bites because you know its soaked with chicken fat that has gotten crispy and delicious. My feelings aren't really mixed. I didn't think the chicken warranted the effort, mess and waiting time that went into it. I'm not giving up on cooking whole chickens. But will be looking for a different technique and flavoring elements next time. I made this chicken along with homemade green bean casserole. Somehow I forgot to take pictures of the casserole....which turned out fabulous! For a beautiful photo and the recipe check out Michelle's blog, The Brown Eyed Baker. This recipe beats the canned soup version. The creamy mushroom sauce has a wonderful garlic flavor and pairs perfectly with the green beans and cripsy onion and breadcrumb topping. It's so so good. Oh, too bad about your pan...that's a bummer! Sorry you didn't love the chicken. I thought it was terrific. Roast chicken can be a pain for sure, but I continue cooking it because it feeds us for a few meals and cuts down on the work I have to do. My favorite way to roast the chicken is to butterfly it and lay it flat. It takes less time that way too, which is a bonus. There's a recipe on my blog from October if you want to give it a try. Isn't it fun to have "first times" to try recipes...I've actually found a few from this Dorie experience that I will make again. That's too bad about your pan. I used a regular old speckled roasting pan and left the lid on, which really made the clean up easier. 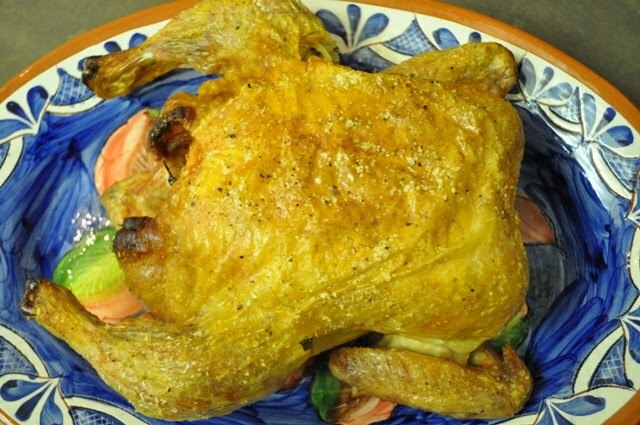 You will find your roast chicken recipe!